Hummus (also spelled hamos, houmous, hommos, hommus, hummos, hummous or humus) is a Levantine Arab dip or spread made from cooked, mashed chickpeas, blended with tahini, olive oil, lemon juice, salt and garlic. It is a popular food throughout the Middle East. Left: Hummus with olive oil, lemon juice, cumin and sumac. The word comes from the Arabic word for 'chickpeas'. Chickpeas and sesame, the crops from which hummus's main ingredients are taken, were known and cultivated in the ancient Mediterranean and Middle Eastern worlds. Chickpeas are hummus's principal ingredient, and have been a human food item for over 10,000 years. 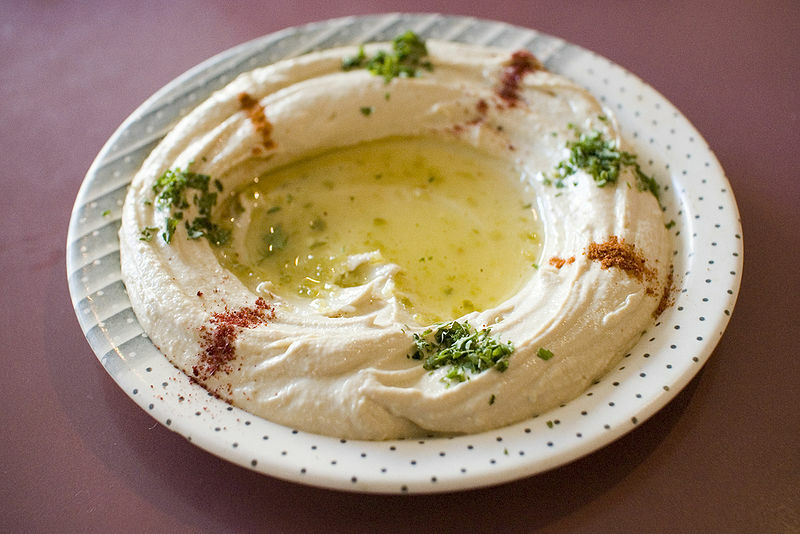 As an appetizer and dip, hummus is scooped with flatbread (such as pita). It is also served as part of a meze or as an accompaniment to falafel, grilled chicken, fish or eggplant. Garnishes include chopped tomato, cucumber, cilantro, parsley, caramelized onions, sautéed mushrooms, whole chickpeas, olive oil, hard-boiled eggs, paprika, ful, olives and pickles. Outside the Middle East, it is sometimes served with tortilla chips or crackers.